Positive Money: How to Fix the Creation of Money? In Autumn 2013, the Green Party of England and Wales voted to adopt a motion that would remove the power of banks to create money, and return that power to a democratically accountable part of the state. But what is money? How do banks create it, effectively out of nothing? And why is reforming money and regulating finance so important for dealing with the big social and environmental issues we’re facing today? In late 2010, then-Governor of the Bank of England, Sir Mervyn King, stated that “[o]f all the many ways of organising banking, the worst is the one we have today.” It’s a statement with which most people outside the banking sector – and many within it – would agree. The 2007/08 financial crisis led to massive increases in unemployment and cuts to public services as governments around the world were forced to bail out failing banks. Many of the countries at the centre of the crisis are still suffering from the consequences today. It seems clear that our banking system is fundamentally dysfunctional, yet for all the millions of words of analysis in the press and financial papers, very little has been written about the real reasons for this. Although there are many problems with banking, the underlying issue is that successive governments have handed the responsibility for creating new money to the private sector corporations that we know as banks. Today, almost all of the money used by people and businesses across the world is created not by the state or central banks (such as the European Central Bank, Bank of England or Federal Reserve), but by the private banking sector. Banks create new money, in the form of the numbers (deposits) that appear in bank accounts, through the accounting process used when they make loans. In the words of Mervyn King when he was still in charge of the Bank of England, “When banks extend loans to their customers, they create money by crediting their customers’ accounts.” Conversely, when people use this new money (or deposits) to repay loans, the process is reversed and money effectively disappears from the economy. When banks feel confident and are willing to lend, new money is created. Banks profit from the interest they charge on loans, and therefore use bonuses, commission and other incentive schemes to encourage their staff to increase their lending, creating money in the process. The loans they make tend to be disproportionately allocated towards the financial and property markets. As a result our economy has become skewed towards property bubbles and speculation, while the general public has become buried under a mountain of debt. Allowing money to be created in this way affects us all. The current monetary system is the reason we have such a pronounced and destructive cycle of boom and bust, and it is the reason that individuals, businesses and governments are overburdened with debt. Central banks maintain that they have the process of money creation under control, yet a quick recap of the debt-fuelled crisis of the last few years calls that claim into question. By handing the power to create money to banks, the state has built instability into the economy, since the incentives facing banks guarantee that they will create too much money (and debt) until the financial system becomes unstable. This is a view recently vindicated by the chairman of the UK’s Financial Services Authority, Lord Adair Turner, who stated that: “The financial crisis of 2007/08 occurred because we failed to constrain the private financial system’s creation of private credit and money” (2012). We have little hope of living in a stable and prosperous economy while the money supply depends entirely on the lending activities of banks chasing short-term profits. Attempts to better regulate the current monetary system are unlikely to be successful: whenever regulation is effective in preventing a certain type of problem in the financial system, it is only a matter of time before lobbyists start to argue that the regulation is no longer needed. Rather than attempt to regulate the current banking system, it is the fundamental method of creating money and getting it into the economy that needs to change. 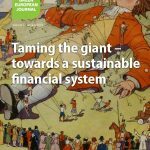 Positive Money, the organisation I founded in 2010, argues for a reform of the monetary system that would remove the power to create money from banks and return it to a democratic, transparent and accountable body. We want to see new money created in the public interest, rather than in the short-term interest of the banking sector. The current monetary system is the reason we have such a pronounced and destructive cycle of boom and bust, and it is the reason that individuals, businesses and governments are overburdened with debt. The key element of the reforms is to remove the ability of banks to create new money (in the form of bank deposits) when they issue loans. The simplest way to do this is to require banks to make a clear distinction between bank accounts where they promise to repay the customer ‘on demand’ or with instant access, and other accounts where the customer consciously requests their funds to be placed at risk and invested. Current accounts are then converted into state-issued electronic currency (‘sovereign money’), rather than being promises to pay from a bank, and the payments system is functionally separated from the lending side of a bank’s business. The act of lending would then involve transferring state-issued electronic currency from savers to borrowers. Banks would become money brokers (i.e middlemen), rather than money creators, and the money supply would be stable regardless of whether banks are currently increasing or decreasing their lending. Without the power to create new money when they make loans, banks would lose a great deal of their power and influence over the state of our economy. After these changes banks would no longer be able to create money. Instead, new money would be created only by central banks (such as the ECB or the Bank of England) and transferred to the government (or divided between national governments in the case of the Eurozone), who would then be able to spend the money in line with their democratically-mandated priorities. There are three main ways that this newly created money would reach the real economy: either through additional government spending; through tax cuts (for example by lowering regressive taxes), or through providing a citizens’ dividend to each citizen of a country. Whereas money created by the banks makes its way mainly into property and financial market bubbles, money created by the state would be injected directly into the real economy. This would boost employment and benefit ordinary people, rather than simply benefiting the wealthiest. In 2012 two IMF economists released a working paper where they modelled the effects of these changes, and found it would lead to a very significant fall in personal debt and a significant rise in employment. (See Kumhof & Benes, 2012). Of course, any attempt to remove the power to create money from the banking system would be met with furious lobbying, meaning that such a change requires a movement behind it. The organisation I founded in 2010 is aiming to build that movement, but we know it won’t happen overnight. Without the power to create new money when they make loans, banks would lose a great deal of their power and influence over the state of our economy. Luckily, there is something that governments could do to address some of these problems immediately. Rather than fuelling the economy by allowing banks to create money as households to go ever further into debt, or by flooding financial markets through Quantitative Easing, the ECB could simply create new money and transfer it to national governments to spend into the economy. This money would reach the real economy far more effectively than money created through Quantitative Easing, and would do so without relying on households to keep increasing their debts. It would make the economy safer and help ordinary people rather than financial markets. This policy, proposed by Lord Turner, former chairman of the UK’s Financial Services Authority, could be used in a wide variety of situations. In the UK, where the economic recovery is fuelled by rising personal debt, this additional spending would offset the rise in debt and prevent excessive household debt leading to another financial crisis. But in Europe, which is in danger of slipping into deflation (a potential downward spiral of falling prices and falling spending), the additional spending could help to keep the economy ticking over. Whereas money created by the banks has the main effect of pushing up house prices and fuelling speculation, the money created by the state can be spent on things with real social and economic value. A recent paper by colleagues of mine, Sovereign Money: Paving the Way for a Sustainable Economy, outlined two ways in which the creation of just £10bn could have a huge social and economic benefit. One way is for the money to be spent on the construction of affordable housing (to cope with the shortage in the UK). Every £10bn spent this way ultimately leads to a £28bn rise in GDP, whilst lowering the cost of living for ordinary people. A second option is to employ people to retrofit the UK’s housing stock with adequate insulation. The UK has some of the most energy-inefficient housing in Europe, meaning that while we have some of the lowest energy costs per kilowatt hour, households lose a huge amount of the energy they pay for through the walls of their homes. Investing in making homes more energy efficient could lower the UK’s energy demands for housing by 40%, with a subsequent fall in carbon emissions. Simply attempting to regulate the existing financial system will not be enough – what is really needed is fundamental reform of the way that our money is created. There is huge potential in reclaiming the power to create money for the public benefit. In Autumn 2013 the Green Party of England and Wales voted to adopt a motion that would do exactly this. The challenge now is to provoke a wider public debate around the fundamentally-important questions of a) who should be allowed to create money, and b) how should that money be used?